I went today to the casting call and I just got through the line just in time. It started pouring buckets 2 seconds later. There were tons of people but they said they would be using 3000 people so I am sure almost everyone will snag some part. They said Martin Campbell will be selecting many of the extras personally. They also asked if we played Golf and what car we drive. Wow, 3000 people - that sounds like a lot. I know that several of you out there worked as extras on some of the other previous movies like Ashecliffe or The Women. Any idea how many extras movies like that used? Is 3000 common? Anyhoo, in other news, Variety reported that they're getting close to signing up Robert De Niro for a role in Edge of Darkness. Robert De Niro is near a deal to join Mel Gibson in Martin Campbell's feature "Edge of Darkness," for Graham King's GK Films. Shooting begins this month in Massachusetts. Gibson stars as Thomas Craven, a straitlaced homicide detective for the Boston Police Dept. and single father whose 24-year old daughter is murdered on the steps of his home. The cop assumes he was the target, but his investigation leads in another direction and uncovers his daughter's secret life, a corporate cover-up and government collusion. 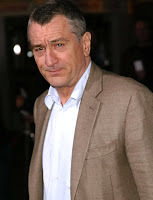 De Niro will play Darius Jedburgh, an operative sent to clean up the evidence. Click (here) for the Variety article. 2 Response to "Edge of Darkness CC Feedback & Robert De Niro"
Forgot to mention they said Deniro had just signed on the previous day. I guess its old news now. One more interesting thing they noted was that it would be filming from August to at least December and the schedule was irregular. They also pointed out that all extras were to develop a character and that no one would be allowed to wear any bright colored clothing. The whole movie will be dark and gritty. There are also rumors swirling that there will be a staged protest in front of the State House just in time for the real elections. Sounds truly awesome. I hope I get selected for any role.